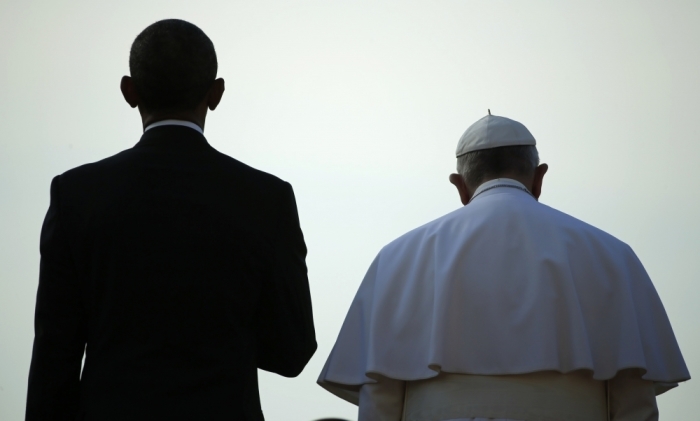 The following remarks were delivered by President Barack Obama and Pope Francis during the Wednesday ceremony welcoming Pope Francis to the White House. Holy Father, your visit not only allows us, in some small way, to reciprocate the extraordinary hospitality that you extended to me at the Vatican last year. It also reveals how much all Americans, from every background and every faith, value the role that the Catholic Church plays in strengthening America. (Applause.) From my time working in impoverished neighborhoods with the Catholic Church in Chicago, to my travels as President, I've seen firsthand how, every single day, Catholic communities, priests, nuns, laity are feeding the hungry, healing the sick, sheltering the homeless, educating our children, and fortifying the faith that sustains so many. Your Holiness, in your words and deeds, you set a profound moral example. And in these gentle but firm reminders of our obligations to God and to one another, you are shaking us out of complacency. All of us may, at times, experience discomfort when we contemplate the distance between how we lead our daily lives and what we know to be true, what we know to be right. But I believe such discomfort is a blessing, for it points to something better. You shake our conscience from slumber; you call on us to rejoice in Good News, and give us confidence that we can come together in humility and service, and pursue a world that is more loving, more just, and more free. Here at home and around the world, may our generation heed your call to "never remain on the sidelines of this march of living hope."